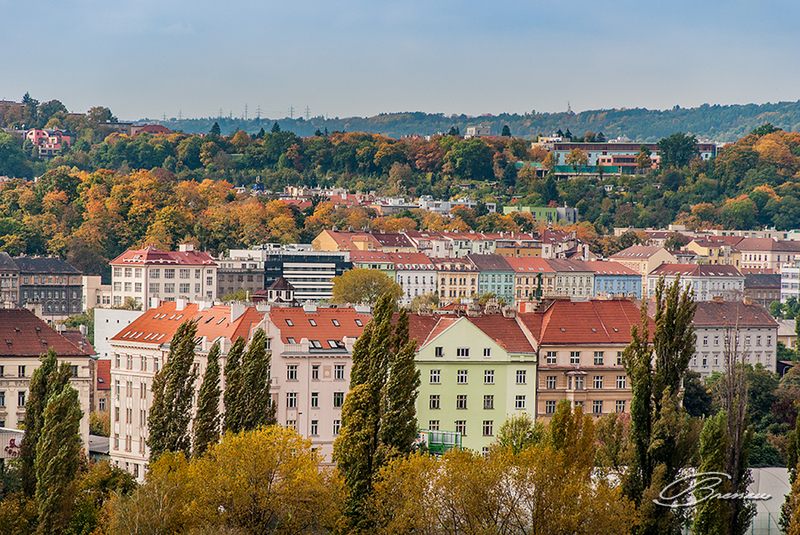 Our last day in Prague was full of surprises as it started with the Sun finally showing up after 15 days of continuous cold, rain and overcast skies. Actually, we did not stay all that time in Prague but driving around many countries in Europe and every single day was like I said above. Sometime in the middle of the trip in Budapest, the weather forecast was announcing sunny days for the next three ones but it rained all the time! The Outskirts of Prag Seen From the Hill. With this in mind, we decided to take the last tour around the city before checking out the hotel and we drove around without a fixed destination until we arrived at what it seemed to be a big wall surrounding a castle. At first, we couldn’t see much but we decided to explore it a bit. That wall was really big and promised something interesting. Barely we knew that we had just arrived at the gates of the Vyšehrad Castle! We had already heard about it but it remained forgotten in our visit to Prague. Now, it was right in front of us and… by accident! That was the second surprise. 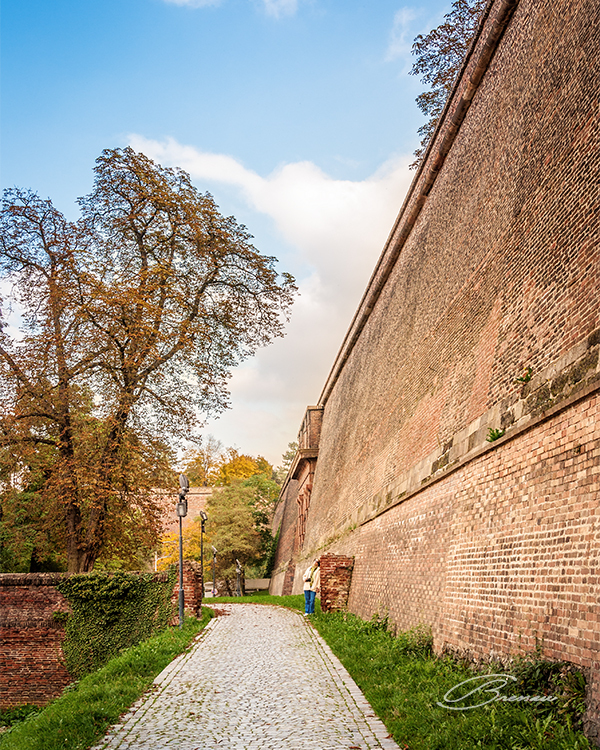 The Massive Walls at Vyšehrad. Another one was just waiting for us as it was possible to enter the castle driving the car and nobody charged us for anything. 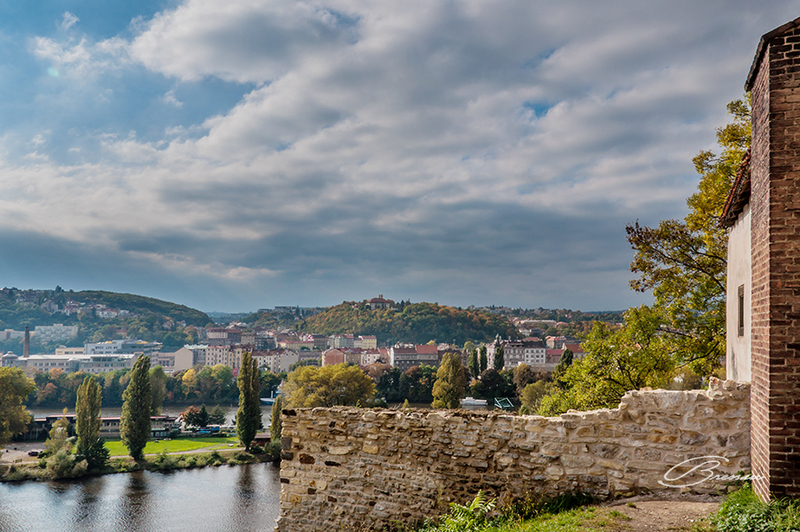 In fact, as we found out later, although simply fantastic, the Vyšehrad Castle is not really a common tourist attraction and we could visit almost everything with few people around. As we could heard there was that historians believe (without full agreement) that the castle was built around the 10th Century and that it became the first settlement to give birth to Prague. 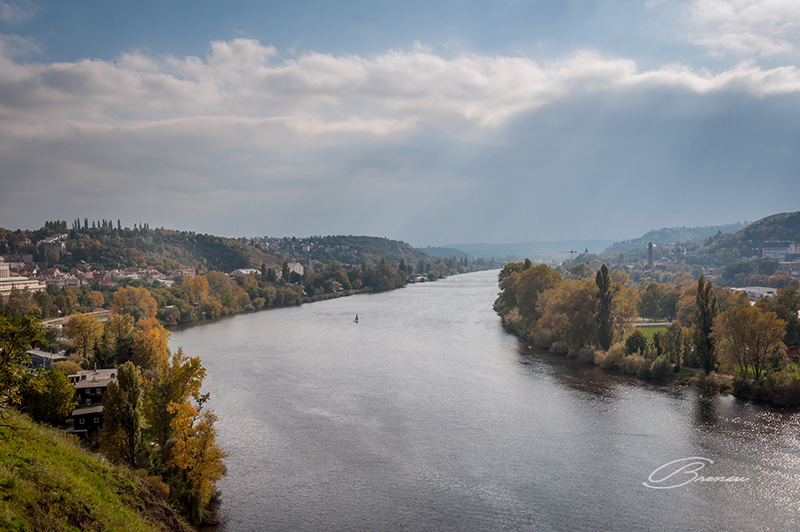 Strategically, it dominates a hill over the River Vltava (the famous Moldau River; I will talk a bit about it later). No wonder that “Vyšehrad Castle” means “The Castle on the Heights” or “High Castle”. Its 1,000 years of History saw various periods of opulence and decadence, dominance by kingdoms around, armies from France, Austria and others, each one either attempting to destroy or to improve Vyšehrad. Most important of all, it so much participated in Prague’s history that Czech kings considered Vyšehrad a place to stay or a historical route to go before becoming kings. 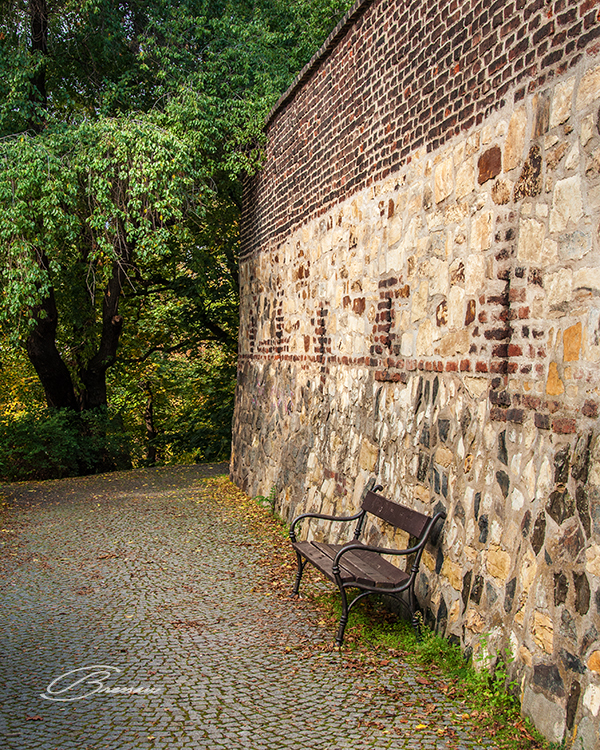 One of the quiet paths around the walls in Vyšehrad. What impresses anyone that visits Vyšehrad is its complexity as it is a large wall that surrounds a castle, the ruins of a large fortification, the beautiful Church of Saint Peter and Saint Paul, a Rotunda, large parks with plenty of bigger than normal statues, a casemate and the famous Vyšehrad Cemetery. Along the walls, on the outside part, there are paths with relaxing benches and vegetation. In the 19th Century, the Vyšehrad Slavin (Pantheon) Cemetery was added to the complex. 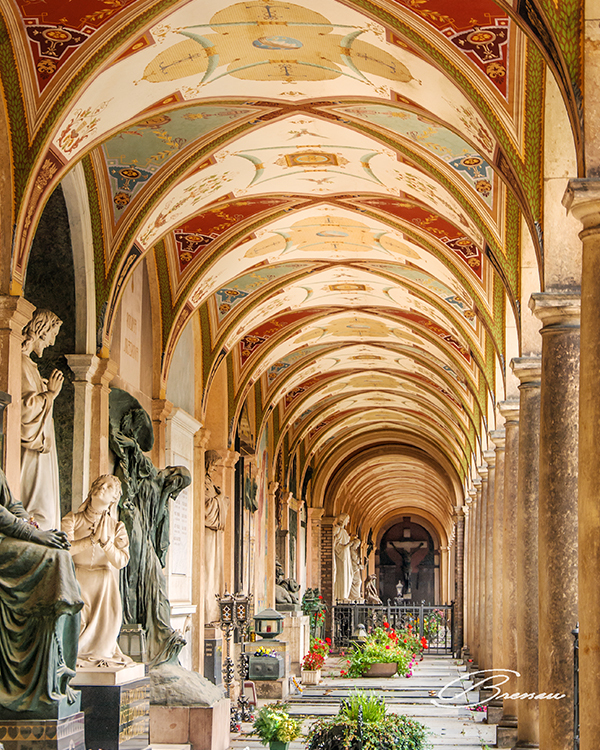 There, famous Czech personalities were buried including Antonin Dvorak, Bedrich Smetana and many other composers, artists, sculptors, writers and intellectuals. But, from everything we saw there, three things really caught our attention: the first one was the calm, large and relaxing park almost in the middle of the complex. I don’t know why, but we felt some sort of peace while walking through the park with big statues scattered all around representing historical people, including the Princess Libuse which started a dynasty that ruled Prague for more than 400 years. She has been said to have visionary powers (maybe a “psychic” in today’s words?) that prophesied Prague would be a big city. The Slavin (Pantheon) Cemetery in Vyšehrad. The second thing catching our attention was the astonishing view of Prague from the hill where Vyšehrad stands, with the Vltava River calmly flowing below and I could not stop thinking about how inspiring was for Dvorak and Smetana to write the beautiful pieces of art praising their beloved Prague. I could almost “hear” Má Vlast while on top of the hill! We stayed there for a while admiring the grandeur, feeling the scene, the vibration, the warm Sun and the light breeze. Vlatava River Seen From Vyšehrad. It did not go unnoticed for me a middle-aged man with an opened book on his hands, occasionally reading it and then staring at the river and the surroundings. Nothing in this ritual denoted fatigue or rush; on the contrary, he seemed to be relaxed and trying to find himself in the environment. I could not resist talking to him. In his bare English, he told me he was a Czech advocate often visiting that spot to replenish himself with the energy emanating from the place. He showed me his book from a Czech writer stating that the place we were at was exactly one of the four vortexes of positive energy in Vyšehrad. Chatting a little while longer, he translated for me another passage of the book – and that came as another surprise for us – that Vyšehrad, although famous, would not really be emphasized as a touristic attraction because it would “naturally attract” those visitors that would “feel” the vibration for the place! In other words, people and visitors would not usually go to Vyšehrad but actually Vyšehrad would attract them through its positive vibration! We don’t know anything about energy vortexes or whether such an “attraction force” exists or even driving some people to the place but all we knew is that we where there and that we felt the relaxing environment and its beauty. We hope one day we could go back there; this time, we would spend far more time to see and feel once more what we felt. And we urge you to do the same when visiting Prague. May the Vortex attract you to go there as well!